there just aren't any mistakes in mixed media, that's what i love about it. you can just layer and blend until you like what you get. for me, it's more about the journey than the destination. i just love the process of experimenting with different mediums and materials, seeing how they react with each other, complement or contrast with each other. every once in a while i toss something, but usually i can turn it around. this batch of atcs that i made for one of my groups was all about improvisation, based upon a single word...indigo. i just sat down with a couple different shades of blue paint and began creating with absolutely no clue where it was going. so much fun! if i didn't like something, i layered over it. I love messy and distressed backgrounds with something more defined in the foreground, which is a popular style amongst mixed media artists today. i also love blending paint, fibers and metallic elements together. i posted the details of the materials and techniques i used on the arts in the cards blog. reason #673 for why i enjoy doing atc swaps...it makes going to my po box ever so much more enjoyable! these cards just arrived from some of the artists in my arts in the cards group. the theme this month was indigo. i am still working on mine, i'll post them soon. the talented women in this group are so inspiring to me, they really challenge me to raise the bar on my own work! next week i will be a featured guest on rebecca parson's show, mixin' it up! on the cool2craft network. in the show, i will give lots of tips about my personal approach to designing a collage - i hope you'll check it out - the whole show has a western theme with a terrific variety of projects. tear and/or trim 3-4 strips of neutral papers, lay them side by side vertically and adhere to your cardstock foundation with the matte gel medium to create a background. using a lit match, carefully burn the edges of your vintage photo, blowing out the flame quickly after igniting the paper. work safely over a metal tray and keep a water mister bottle close by, just in case! trim, layer, and adhere two pieces of contrasting bright color papers together for a frame and adhere the photo on top of them; adhere all but the lower corners of the frame to the background. tear a piece of paper with words or poetry on it that compliments your photo, and tuck it under the corner of the frame, glue it all down. glue a few patches of patterned papers on top, and punch your brads in as desired. wrap some yarn "rope" around one edge and tape down on the back. embellish the photo frame with decorative metal corners. adhere the foundation to the second piece of cardstock to hide the brad prongs and yarn edges....and enjoy! here's what i ended up finishing from the hotpad demo i started last week on wednesday night live. i started with all circle appliqué pieces (no strips) and tried random curves and free-motion (ish) circle quilting, but didn't like it so much, it just didn't look cohesive. then i thought of anchoring the circle appliqué pieces with a continuous waffle stitch pattern, which i like better...the contrast of all the circles and dots with the straight lines looks more interesting to me. plus the straight lines are easier to stitch! i still need more practice on mitering my corners - this one in front turned out perfect, the other three are a tad wonky! this week on wednesday night live! i shared a whip-it-up quick bottle cozy project with insul-fleece (a special interfacing that insulates). after the show, i finished up the project with some fabric scraps and silver studs. this was pretty fun to make and the insul-fleece will keep my water colder for longer - yay! wooohooo! 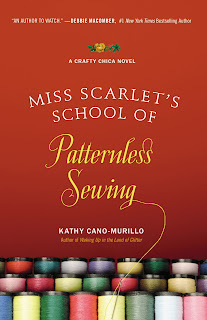 i'm so happy to be part of my friend kathy cano-murillo's blog tour for her newest crafty chica novel - miss scarlet's school of patternless sewing! i received an advance from her publisher and started reading it right away. i enjoyed kathy's first novel, waking up in the land of glitter, so i knew i'd love her miss scarlet. first of all, kathy is just about the nicest, sweetest, kindest person you'd ever want to meet. we know her as the crafty chica, a madly talented artist and crafter with a creative passion for her latin roots. 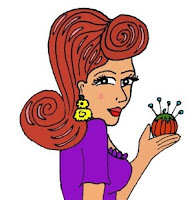 kathy's writing style is lovingly descriptive and fun to read. her characters are immediately likable and relatable...as an artist and a crafter myself, i get such a kick out of their crafty lingo, thoughts, and mishaps. it's like there are little private jokes woven into the story just for me. i was drawn to the title right away, because i am all about patternless. i rarely use templates or patterns when i create. i am all about the shortcuts - i hate to measure, i leave the instructions behind, and i tend to design on the fly, tweaking mistakes into opportunities as i go along. and on a more figurative note, the book's tagline really resonated with me too... sometimes to find your life's true path, you have to stray outside the lines. what is the wierdest thing in your fridge right now? The item itself isn't weird, but the way I use it kinda is...I always keep a tub of dark chocolate ready-made frosting in the fridge. That way when I need a quick hit of the hard stuff, I can run over and dig out a teaspoon and savor it! I only allow myself to do that a couple times a week so it lasts a long time. Hit and run chocolate! if you were on the show, survivor - what is the one luxury item you would bring with you to the island and why? I would craft a mini-suitcase and have my iPhone, charger, drawing pad, pen, red lipstick - oh and pictures of my husband and kids - all stitched together so they would count as "one" item! what is your go-to doodle when you're in a boring meeting? It's always henna-inspired flowers in the corner of the paper. And then I add vines and leaves up the side to the top corner, next thing I know there are more doodles than notes! If it is a super professional meeting, I'll write the topic of the meeting in fancy bubble letters so it looks like I think it is super important and exciting and no one will mind me getting doodly with it. one lucky winner will get a copy of both books! just leave a comment here on this blog post to enter for your chance to win...i will pick a winner on friday, march 11th at midnight (pst). good luck! 3/12 update: congrats to Tracy, aka "scrappynana" who won this drawing! visit kathy's flickr gallery to see more of her art. i love her colorful drawings, her style is just so happy! a couple times a year at c&t publishing where i work, we hold a craft camp for the staff. the quilters, sewers, artists and crafters among us pick one of our newer books or products and create a project to teach. it gives us a break from our computer monitors, and also gives us a better appreciation for what we spend all day producing and selling! my co-worker ruthmary taught us how to sew a hot pad with insul-fleece® and raw-edge appliqué, inspired by patterns found in the book, tile quilt revival. she provided us with wonderful instructions, templates, and measurements...but in my true shortcut queen style, i tossed all that and went rogue with my scissors. rather than mitering the corners, i pinched them up so they look kinda like little finials or something, i think it's a cute shortcut. there are two layers of insul-fleece, so it's nice and thick, it will protect the table where you want to place a hot dish. i did just a minimal amount of quilting around the edges of the appliqué shapes and some straight lines that cross through the center. i shared what i learned on tonight's webcast - click here if you want to learn how to make one for yourself in fabrics that match your table linens, they are pretty quick to stitch up. recently i joined a quilt guild, contemporary quilt & fiber artists. the women in this group spent a whole year arranging for a special member exhibit of art quilts called "primal green" at the san francisco public library to celebrate earth day...it runs through the end of july. i am still a beginner with fiber art and quilting, and i have only made a few pieces so far, but i really wanted to submit something - such an amazing opportunity! my piece was accepted, along with the amazing and inspiring work of 19 other artists - so exciting! the sf library is a huge facility, i'm going this weekend to see the exhibit for myself. these pics were taken by my friend and fellow cqfa member, jaye lapachet. my little rosebud quilt, puckered seams and all, is in a display case (left) with a killer view of san francisco city hall. here is my post from last year when i first made this quilt for a challenge that was displayed at the quilt show for my local county guild that i also belong to....it has more details about my materials and design. i gave the quilt to my mom as a gift last spring, but when i heard about the environmental theme of the cqfa show, i thought this image was a good fit so i snagged it back off her wall, lol! i love the fragrant rosebushes in my front yard - i am always amazed at how stark they are in the winter and how beautiful they are when the blooms return each year. i'm so excited to finally be able to give you a sneak peek of this project i designed for the book, countdown calendars, coming out in june! this version of a countdown calendar is perfect for the bride-to-be who wants to save all her clippings, pictures, articles, brochures, etc. in pretty pockets, while she is planning her wedding and counting down to the big day. materials include fast2fuse, lutradur, tap, organza and fabric. you're gonna want this book, it has so many cute projects from more than 20 different designers. on wednesday night live recently, i showed how to make this fabric postcard using tap and fast2fuse. i love this book, the spirit of the chinese character. it shows you how to draw 50+ characters for great words like sincerity, harmony, sage, and destiny. i like painting them directly on to fabric, but for this card i scanned in the character, reversed it, then printed it on tap to transfer it on to fabric instead...much easier! i did the same for the word in english...type, reverse, print and transfer. the web texture behind the character is black mistyfuse trapped under the tap, on top of green fabric - i love this effect. after fusing everything down, i stitched around the edges, fused cardstock to the back, and it's ready to send!